Search for the best flight prices from Manchester to Beijing. Compare prices, book today and save money with Manchester Airport. Beijing’s historic attractions are one of its most popular draws. Built in the 15th century, the Forbidden City is a mesmerising complex of courtyards, halls, pavilions and gardens, and is home to a vast collection of priceless relics. Tiananmen Square is the world's largest public square, and offers up the Chairman Mao Memorial Hall, the Qianmen Gate and the Great Hall of the People. Another magnificent attraction is the Summer Palace in the northwestern suburbs. Culture buffs visiting Beijing have much to explore. From opera and acrobats to fine art museums and antique markets, this is a city with rich and exuberant cultural heritage. An atmospheric tea ceremony is a particularly lovely way of experiencing a long-standing Chinese tradition. For something more active, there’s Kung fu - spectate or get hands on at one of the city's sports centres. The easiest way to get around Beijing is by taxi. They can be hailed on the street and tariffs are affordable - drivers may well not speak English so having your destination name written in Chinese can be a big help. Beijing’s bus system is cheap and far-reaching, but can be tricky to fathom for those with no Chinese. The subway system is also vast but easier to use. For those keen to avoid the traffic, cycling is a good option thanks to the flat roads with cycle lanes. China’s serpentine Great Wall is the country’s most iconic attraction. And for good reason. Set against deep green hills, the system of towering stone fortifications is a truly arresting sight. The Great Wall stretches over 6,700km across the country’s northern lands, and dates as far back as the third centaur BC. Its construction is viewed as one of the most impressive to date, and today the Wall - which is actually several walls interspersed with impassable terrain such as mountainous peaks - is a mixture of crumbling ruins and defiantly resilient sections. Built in 1651, Tiananmen Square is an immense expanse of bright white paving stones and one of Beijing’s most popular visitor attractions. At 109 acres, it ranks within the top ten largest city squares in the world and is the geographical centre of the city – as well as the symbolic centre of the Chinese universe. Get there early and witness the daily raising of the national flag for a memorable experience. Take a day to explore the many magnificent courtyards, bridges, halls and gardens that make up the Forbidden City (named as such because it was off limits to visitors for 500 years). This spectacular collection of ancient buildings was once home to 24 emperors between 1420 and 1911. To take it all in, several visits may be required – and make sure to wear comfortable shoes, as the palace is 960 metres long and 750 metres wide! The Hòuhǎi Lakes (comprising of three different lakes) are a popular spots for Beijinger’s, who relax by the shore in the day, flying kites and people-watching, or explore the lake on pedalos. Once winter arrives, the lakes freeze over, allowing visitors to ice-skate, or even hire ice bikes and ice bumper cars. Meanwhile, when the sun goes down, Hòuhǎi transforms, as restaurants, bars and café’s open up and party-goers flock to the area to enjoy the music and bright lights. Built in the Ming Dynasty, every year at winter solstice, the emperors would come to the Temple of Heaven to pray for a good harvest. The UNESCO-listed site is described as a ‘masterpiece of architecture and landscape design’, and a trip to the Temple will not disappoint. Arrive early in the morning and not only will it be quieter, you’ll also be able to watch locals doing their morning exercises, including tai chi, karate and traditional dance. Of course, a trip to Beijing would not be complete without visiting the spectacular Great Wall, which snakes more than 6700km across the northern lands. As the saying goes: ‘He who has not climbed the Great Wall is not a true man’. Culture buffs visiting Beijing have much to explore. From opera and acrobats to fine art museums and antique markets, this is a city with rich and exuberant cultural heritage. An atmospheric tea ceremony is a particularly lovely way of experiencing a long-standing Chinese tradition. For something more active, there’s Kung fu - spectate or get hands on at one of the city’s sports centres. Beijing - and China as a whole - has developed a unique history spanning over 5,000 years. Due to its close proximity with the Himalayan mountain range, rainforests to the South, and harsh Siberian climate moving north, there is an sense of fascinating otherworldliness when visiting Beijing for the first time from the Western world. The rise and fall of dynasties has been the story of the nation since records began, with elements of a fortified Chinese culture evident in the characters and dragons which make up so much of Chinese folklore. Many Beijing citizens can impart knowledge on the history of the city, while a journey though the National Museum of China; located in the East side of Tian’anmen Square, Dongcheng District, offers a truly unforgettable insight into the nation's art and cultural history as a worldwide civilization. Chinese religion and philosophy are culturally and historically intertwined, with traditional Chinese beliefs and philosophy at the core of society as opposed to any one dominanting religion. There are three main strands of religious practice which many Beijing and Chinese inhabitants may choose to follow, or combine preferable elements of each. Confucian, Buddhist and Daoist belief systems are represented in the form of temples across Beijing, including the iconic Temple of Heaven, while Christianity and Islam are increasingly burgeoning religions across China. This temple is located south-east of the city centre, harbouring a history of Daoist and general heaven worship which once upon a time saw past dynasty Emperors visit to pray for a good harvest. Beijing is at the forefront of a Chinese culture revered for expressing itself through literature, Peking Opera and Chinese calligraphy. The highest form of Chinese art in calligraphy is an abstract representation of characters in delicate brushstrokes most notable for their written style as much as the message they create. Even cultures who don't speak the native tongue can appreciate the beauty of calligraphy, with calligraphy body tattoos among the most popular across the world. Away from the spiritual power of the written world intrinsic to traditional culture, Peking Opera, or Beijing Opera, is a traditional theatrical dance which combines music, vocals and acrobatics as a mesmerising speactacle which is often enjoyed at the egg-shaped modern dome of the National Center of Performing Arts near the Forbidden City. A large part of the allure for travellers to Beijing is the vast architectural differences between China and the Western world. While Beijing has seen something of a 21st Century sprouting of contemporary archictectural design (due in part to the new buildings created as part of the city's hosting of the 2008 Olympic Games) there remains a defiantly imperial counter-balance when walking through certain districts. 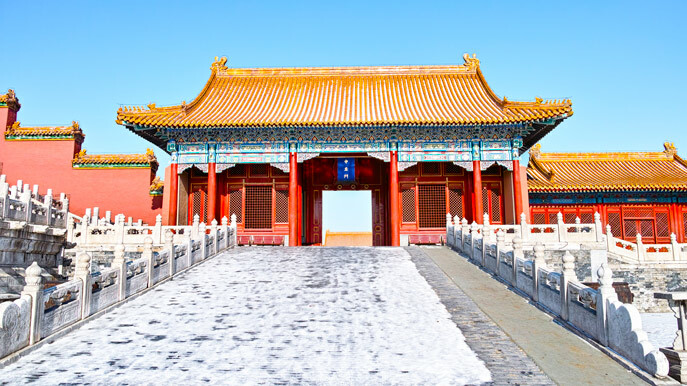 For every National Stadium and National Centre of Performing Arts, there are traditional buildings such as Tiananmen Square, Forbidden City and the Lama Temple. These buildings lend themselves to the striking symmetry of balance in Chinese culture, which ensures that immaculately kept palaces, comprising walled gates, timber wood panels, flat-tipped roofs and inner temple complexes are always part of a greater, picturesque whole. The near incomprehensible 13,200 mile east to west China stretch of The Great Wall means travellers tend to pinpoint which section of the wall to visit. Each primary section of The Great Wall provides a striking indication of just how great an architectural feat it was. Meandering through deserts, mountains and plateaus, The Great Wall offers a unique vantage point in which to survey China's diverse landscape. The Badaling section, which can receive up to 70,000 visitors per day, will undoubtedly appeal to the majority of visitors to Beijing, with good access facilities and relatively straightforward climbs. Among the most frequented stretch of all, Badaling can be reached easily by public transport at just over 40 miles from downtown Beijing. It is also one of the most preserved sections of The Great Wall, and represents the best chance of witnessing this astonishing shrine to Chinese civilisation. At more than 2,300 years old, The Great Wall of China, built with a combination of stone, soil, sand and brick, still stands defiant as the longest wall in the world. Originally built in ancient China by the Zhou Dynasty and eventually several dynasties to protect their respective territories from invasion, it wasn't until The Ming Dynasty rebuilt the wall around Beijing between 1368–1644 that greater building techniques allowed enhanced fortification in turning the wall into a fully-equipped military blockade. The famous flanking towers situated roughly every 500 metres along the wall allowed for archers to defend from a perfect vantage point, while vulnerable passes were protected by fortresses built to withstand even the most deadly attacks. The Great Wall is as much a part of Chinese folklore as it is a structural embodiment of the determination and creativity of its inhabitants. The tale of Meng Jiang Nü weeping over the Great Wall is among the most famous, detailing the legend set under the Qin Dynasty in which a section of the wall collapsed and Meng Jiang was said to cry over the death of her husband in constructing the wall. A stay in Beijing, as the capital and second most populous city in China after Shanghai, naturally provides plenty of accommodation options. Due to the sheer sprawl of the Beijing Municipality, reside choice depends greatly on which of the five core city districts you wish to stay. Affordability and hotel style varies greatly even within designated districts, with forward thinking luxury hotel designs including the New World Beijing Hotel (No.8 Qi'nian Street, Chongwenmen, Dongcheng District) available in the same breath as affordable yet appeasable options such as the Double Happiness Beijing Courtyard Hotel (No.37 Dongsi Sitiao, Dongcheng District). Family focused options include The Peninsula Beijing (No.8 Goldfish Lane, Wangfujing), while the discerning business traveller may enjoy the Ruyi Business Hotel (No.17 Beiwa Road,Haidian District). From ramshackle markets to malls stuffed with luxury brands, shopping in Beijing is as adventurous as you want it to be. For department stores and big brands head to pedestrianised Wangfujing Dajie where you’ll find the vast Oriental Plaza mall, while Sanlitun has the trendy Village. The Beijing Silk Market has fine tailor-made clothes in abundance, while Liulichang, near Heping Men subway station, is great for antiques. The open-air weekend market at Panjiayuan Jiuhuo Shichang is a wonderful place for a one-off find. Just the mention of Chinese food conjures images of steaming banquets of sticky noodles, glazed meats and delectable dim sum. Beijing certainly does not disappoint. Feast on classics such as Peking Duck at high-end restaurants for heavenly versions of your favourite dishes or branch out into the weird and wonderful with the likes of fried scorpion and duck’s tongue at traditional markets. The international dining scene is also on the up, with all manner of global food easy to come by. Chinese cuisine is renowned the world over for its innovative fusion of succulent meats, vegetables and sauces which always make for a flavoursome meal. There is nothing like tasting the real thing, with Beijing roast duck being a must try when visiting the capital. Beijing roast duck or Peking duck, is known for its thin, crispy skin, which is served in larger quantities than the meat itself at the more authentic dining spots. Many restaurants provide a spectacle in the form of carving the duck beside diners. Short demonstrations on how to accurately prepare a Peking duck wrap are often provided, although the mouth watering taste isn't solely dependent on the quality of the preparation! Roasted Duck At Qianmen Quanjude in the Congwen District and Dadong Roast Duck in the Dongcheng District are just two of the top restaurants to find high quality duck dishes. Further popular food with Beijing inhabitants and tourists alike includes Chinese Dumplings, otherwise known as Jiaozi. Sample Jiaozi and taste a fundamental fixture of Chinese cuisine dating back many generations. Beijing and greater Northern China is where soy sauce, vinegar and chilli dip are ingredients almost exclusive to this particular region. Dependent on where you choose to sample Jiaozi, a wide range of meats and vegetables can be chosen to make up a personal take on a hugely popular national dish, while the dumpling focused eating houses are the best bet for finding high quality iterations. Another dining staple in Beijing is jingjiang rousi, or shredded pork in Beijing sauce. Popular dishes across eating establishments and snack houses across the city are often variations on established Chinese fare, although jingjiang rousi is a bona fide Beijing staple. The popularity of this beacon of authentic Beijing cuisine rests in its simplicity, with sliced pork cooked in a sweet bean sauce making for a brilliant wrap based treat on the move. There are thousands of restaurants and fast-food chains catering for both western and eastern cuisine, although for a true taste of imperial Beijing, it is worth venturing towards the classic cooking of restaurants such as the scenic setting of 1925 established Fangshan Restaurant in Xicheng District. Fresh ingredients and eye catching presentation are the order of the day, with each mouthful representing hundreds of years of traditional culinary evolution which was enjoyed by emperors and dynasties of China. Local snacks are also a popular choice on the streets of Beijing, with busy night markets harbouring local and worldwide cuisine offering travellers an insight into daily Beijing living. Food streets to visit include Guijie Street, comprising over 150 storefronts and restaurants, and Donghuamen Night Market, where locals and tourists alike are drawn in by the natural aromas permeating a true Beijing market attraction. Renowned for providing some of the most eye catching firework displays on earth, this vibrantly colourful celebration of the Chinese New Year is reason alone to visit the nation. Chinese New Year is celebrated across all major cities and towns in China as a predominantly family focused affair, representing a great chance to experience Chinese culture in one of many temple fairs, with the most iconic being at The Temple of Earth Park in Beijing. Harnessing the raw energy and vibrancy of Chinese cultural festivals, the Beijing International Kite Festival takes place free of charge at Chaoyang Park every April. Dragon dancing and kite displays from avid kity flying teams from across the globe are features of a festival which recognises that kity flying has been a Chinese pastime for an entire century. The Mid-Autumn Festival is among the most crucial of events in a Chinese calendar year. The event takes place on the 15th day of the eighth lunar month of September where it is known a full moon will be on display, providing families across China with a perfect moonlit setting for which to enjoy a memorable family occasion and feast on moon cakes. The China Open Tennis Tournament is an important ATP event in the diaries of Chinese tennis fans and players alike. With the tennis season drawing to a close and the victors of all Grand Slams decided, who will reign supreme at the Beijing Olympic Green Tennis Centre? With four railway stations, travelling by train is a great way to get around China. Most cities in the country can be reached by rail, and the recently built inter-city railway will allow you to reach Shanghai in just five and a half hours. Train travel here is comfortable and cheap, but be aware that little – if any – English is spoken on the trains. Another cheap transport option for Beijing is to take the bus, although don’t expect a seat – buses here tend to be extremely crowded, particularly at rush hour. Minibuses cost slightly more, but they are more comfortable, faster, and – best of all – you’re guaranteed a seat! Once known as the ‘kingdom of bicycles’, cycling is still one of the most popular transport options in China, and Beijing is no different. Hire one from a hotel or bicycle shop for around 20-30 yuan a day and escape the traffic as you explore the city on two wheels. Traditional rickshaws are a great way of experiencing Beijing’s culture and handy for exploring the winding Hutongs and alleyways. For a higher price, you can take a rickshaw ride with a professional guide, and learn more about Beijing’s history and culture as you ride. Prices can vary, so ensure you agree on a set price before getting onboard. Beijing is also easily explored on foot, with tourist attractions such as Tiananmen Square, Beihai Park and the Forbidden City easily reached within a quick walk from many of the major city centre hotels. Walking tours with a professional guide are also a great way to learn more about Beijing while avoiding the traffic.